Will the extra DLC make it to Wii U? Batman: Arkham Origins is the latest game in the Arkham series and will be appearing on a range of formats in October, including the Wii U. 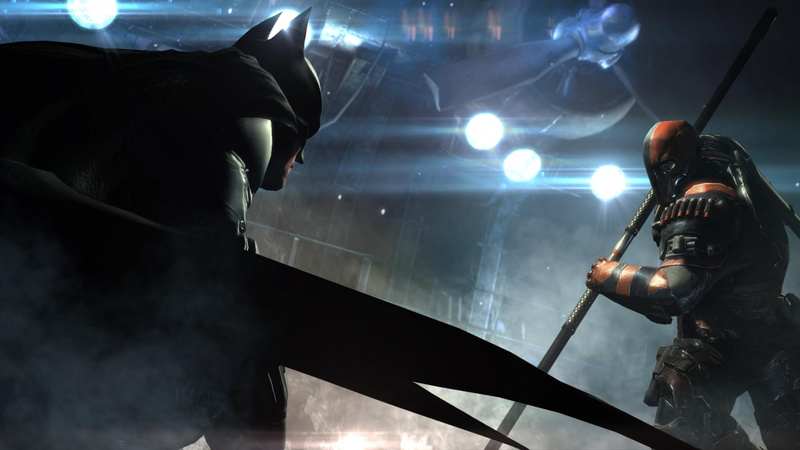 This isn't the first game in the series to be available on Nintendo's home console as Batman: Arkham City Armored Edition was released upon its launch. That game had several Wii U specific features and many have been wondering if Origins will get the same treatment. In an interview with Joystiq, the game's Senior Producer Ben Mattes said the Wii U edition will have specific functionality developed for it but he didn't go into any real detail. We're not talking about specific features but we're encouraging people to imagine. We obviously paid to attention to the Wii U platform and what sort of functionality makes sense for that platform. In the same interview, Mattes said WB Montreal - the developer behind this iteration - was not talking about the platforms DLC will be coming to. Recent rumours have been circulating suggesting the Deathstroke DLC, which features two challenge maps and a couple of skins, will not be coming to the Wii U. An advertisement showing the Deathstroke pack states that DLC is "not available on all platforms". We'll just have to wait and see if the DLC will be available for the Wii U version, but based on the previous track record with the DLC of other games we're not overly optimistic. What are your thoughts on the Wii U functionality. What do you imagine will be implemented? Let us know in the comment section below. WB already confirmed wii-u will not get dlc. Never played an Arkham game... But this looks Awsome... Will be one of many Purchase's this Fall on my Wii U ... Stoked!!! I love it when some 3rd party developers appreciate Wii U. Thank you WB! @ferthepoet what is that based on? @ferthepoet If it would get high sales on wii u, it surely won't be the last. Instabuy if it's anything like Arkham City:AE. This could be the third 3rd party good game to take advantage of the gamepad after Zombi U and AC:AE. DLC would be neat, but I doubt it'll come to the Wii U. My bro really likes Deathstroke; Deathstroke is one of his favorite DC characters. It doesn't matter to me if the Wii U doesn't have DLC, I'll just enjoy the other stuff, especially given the success of the predecessors. why is DLC not happening on Nintendo platforms? Its very strange. How can these companies keep bagging on the WIi U for lacklustre sales of their games when they keep making their games inferior to other platforms. It doesn't take a genius to realize that having the Wii U game be the same if not better than the other versions will increase sales. But heres hoping that this trend ends soon. @TOMBOY25 That's pre-order bonus. Not DLC later on along the way. I'm going to support any third party game that cares about Wii U. In your face EA!!! Someday, you'll come crawling back to Wii U once its sales start to boom from MK8, SSB, Zelda U and others. The PS3 get exclusive content so i'll probably be buying this for the PS3, and the fact it's supported with DLC if i want it. I have an Alienware PC that runs Batman at more than 60 frames per second (all graphic settings put at highest) using an xbox 360 controller. I much preferred playing the Wii U version specifically for the gamepad. I love my PC a lot, but I plan on getting the Wii U version of the next Batman game. In my opinion, Batman Arkham City took advantage of the gamepad better than any other Wii U game. I tried playing batman without it afterwards and did NOT like the experience as much. I love how the gamepad is basically the computer on his arm. It adds such a nice rpg-ish element. No DLC would be disappointing, but as long as the DLC wasn't additional story, not a deal breaker. I'm looking forward to a Wii U price drop/LE bundle once PS4 and Xbox1 release. I love Batman and will buy this on Wii U. I do think most 3rd party support will probably be indie games on eshop which is cool. However, I don't think major third parties will abandon the Wii U. Activision, Ubisoft, WB, and Disney. As long as sales pick up this Christmas they will put games on the system. I'm torn. I'm not sure if I want the Wii U version or the PS3 version. Problem is no one has really offered much dlc for the console so how do they expect it to sell??? This is probably the only upcoming third party Wii U title that I'm super excited about other than Rayman: Legends. Sonic Lost World, has potential. We'll see. I disagree. Come holiday season when people are choosing a 400 dollar ps4 or a 300 or 250 dollar wiiu (obviously the xbone is out of the serious threat question) developers will start being comfortable with the wiiu.